Chelsea, I’m answering your housekeeping question in a separate article, so take a look there for organization tips. So many of us can relate to your marriage question! Anyone who has married for more than a few months has probably felt at least a little tension about household chores. I want to encourage you to set aside a little time to intentionally work on figuring out a reasonable chore routine with your spouse. Pray for an opportune time to do this, and ask God to help you and your spouse have clear, open minds as you work together to create unity about housework. Realistically consider how much time each of you have to work on household tasks each week. While the dynamics are different in every home, if you both have full-time jobs and good health, then you should likely be dividing most of the cleaning tasks. But, if your husband is working outside the home and you’re not, then your load at home should probably be much heavier than his. Be really open to condensing or cancelling outside activities. If you’re constantly running to various events, practices, meetings, and service projects, plus stopping by the grocery store three times each week, then you can save a lot of time by simplifying your schedule which will allow you to be more available at home. Keep in mind that many of your – and your spouse’s – ideas about who is in charge of which chore likely stems from childhood. Did his mom cook dinner, then do dishes alone while his dad watched television? Perhaps that’s why he expects you to take care of things all evening while he relaxes. Or maybe your dad mowed the grass every week, took the trash to the curb, and washed all the family laundry. If so, that probably has something to do with why you get frustrated when your husband doesn’t just jump on those tasks without being asked. If chore time is a continual frustration in your marriage, go ahead and dig deep. Take a trip down memory lane and discuss how chores were handled in your childhood homes. Doing so will likely give you a lot of insight into why you both have very different ideals. Be kind to each other about your childhoods and ideals, but also recognize the rhythm and needs of your own home likely differs from what you grew up with, so be willing to make changes as needed. I read in His Needs, Her Needs the things a spouse complains about is usually what the spouse needs most. For example, if your husband complains that dinner is never ready on time, there’s a chance that acts of service fills his love bank. When that need isn’t met, it’s depleting his tank. If you’re regularly upset that your husband has to work late before wanting to unwind alone after he gets home, there’s a good chance that quality time together or conversation is one of your top needs. Use the knowledge you can gain about each other’s needs to help you communicate better as you learn how to use everyday household tasks to fill each other’s tank. Ask your husband what his top three housekeeping priorities are and focus on those. Maybe he doesn’t care if your child’s room is a mess but he doesn’t want to trip over toys in the living room. If so, leave you child’s bedroom alone for a little bit and focus on keeping things picked up in the living room! As you work on decluttering your home and improving your cleaning habits, you can add more tasks back in later, but for now focus primarily on the three areas that are most important to your husband. Just make sure to keep your requests to three, because you want to focus on only the most important items without making your spouse feel overwhelmed. You’re going to mess up. So will your spouse. Give each other the grace and encouragement that you want to receive when you fall short. 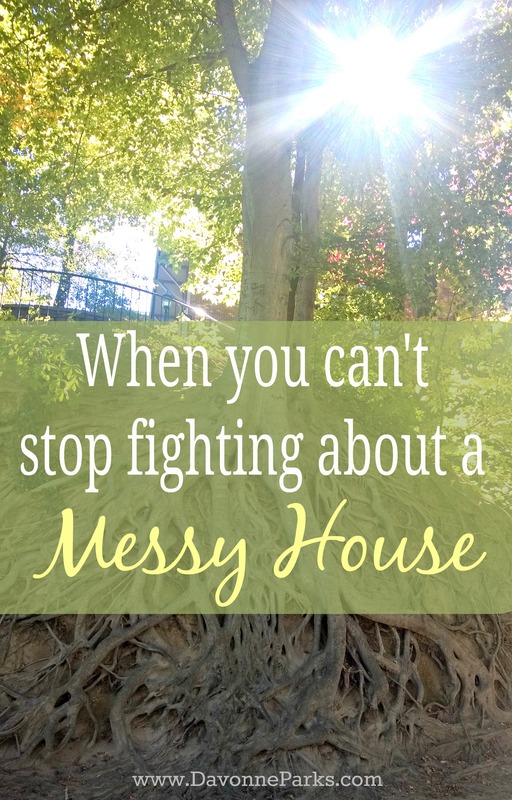 If any of you reading this are thinking that you have the opposite problem – you want to declutter but your spouse isn’t on board – then make sure to read this post about what to do when you’re married to a pack-rat. Personal Thought/Application Question: What is one thing you can do – even if your spouse isn’t yet on board – to cultivate peace about chores in your home? I love that book. Yes, my husband and I have different needs too – even when it comes to our home. My husband likes to keep us eating at home, and likes us to have our evenings free. Even if that means a few things I didn’t get to go undone. I like to have everything clean in the evenings to relax. So, to balance, I try to make sure I get the things that will bother me done first – because I know I want to be present for him in the evenings! <3 Great post! That’s a great point, Mandy! Thank you for sharing your thoughts! How neat, Tabitha! I visited that area last fall and I was taken away by the charm and beauty. It is a lovely place! I really appreciate this article. My question is what if your husband dislikes the messy house but does not contribute in the bare minimum to even pick up after himself (wipe toothpaste off sink, refill tp, pickup dishes after eating, leave cups, shoes, misc out) and will not support you in teaching children to do so either. He also prefers to have evenings and weekends free of chores. I feel like I am working towards an impossible goal and will always fall short. If you’d like to comment back or email me at Davonne@DavonneParks.com to give me a little more insight to the particulars about your schedules, I would be happy to try to help you think of some practical solutions.